Just three days after Canon announced a pair of pro cameras, Nikon unleashed it’s own duo of high-end digitals: The ultra high-end D3 and the still really high-end D300. 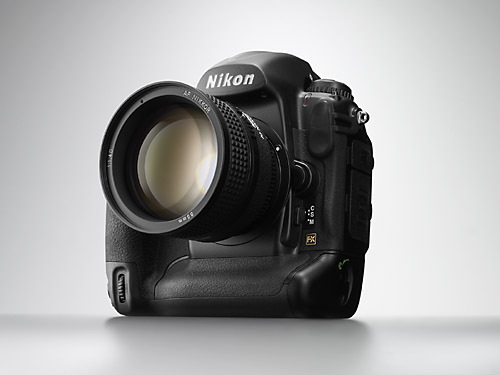 It leads with the Deathstar of SLRs, the D3. The biggest change is, in fact, one of bigness. Nikon equipped the new camera with a 36x23.9-millimeter image sensor that’s nearly as large as an old 35-milimeter film frame. Previously only Canon made these “full-frame” sensors, which capture extreme wide-angle shots and have larger pixels to soak in more light. The high sensitivity isn’t just for night shots. It also lets you get enough light at ultrafast shutter speeds (up to 1/8000 second) for freezing sports and other action scenes. And the camera’s new Expeed brain can process 9 photos per second for up to 64 continuous shots. That separates it from Canon’s 1Ds Mark III, which grabs up to 56 pictures at 5 per second. Canon’s 1D Mark III (note the lack of an “s”) is still the speed champ at 10 shots per second, but it has a smaller image sensor. The D3 also gets live shooting, which allows you to see real-time images on its three-inch LCD before you take a picture. (With most digital SLRs, you can compose shots only in the optical viewfinder.) The D3 also has a slew of smaller improvements to items including autofocus, white balance, and automatic in-camera image correction. Nikon hasn’t announced how much the D3 will cost, but it should be in line with the camera it’s replacing, the D2Xs, which sells for about $4,500. A small step below the D3 is the new D300. Its 12.2-megapixel sensor is in the standard size of 24-by-16 millimeters, and sensitivity stops at a still-impressive ISO 3200. It’s nearly as fast—shooting up to 100 photos at 8 per second. Otherwise, it’s virtually identical to the D3, and probably at a steep discount. The D200 it’s replacing currently costs about $1,600. It will be going head-to-head with Canon’s other new camera, the 10.1-megapixel EOS 40D, which sells for $1,300. I spent a few happy weeks with the D200 last summer and fell in love with its easy controls and spot-on color accuracy. My only gripe was with the low-light performance—an area where Canon dominates. If Nikon’s new focus on light-sensitivity pays off, we’re in for a real clash of the camera titans. I've never really liked Nikon cameras. I was initially impressed with the D200, although after more than a week of habitual use, I began to find chinks in its armor. 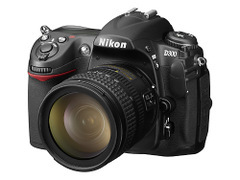 My main concern with Nikon's new line of digi slr's is that they don't really up the bar at all. 12.5 MP will be crap within 5 years, so why would I invest in something that I know won't hold up with the industry standard? Fact is the entire Digital SLR field will be flipped upside down once Adobe releases their lightfield lense. In the meantime I'm waiting and saving to buy a camera when that lense is released. A Canon XTi is adequete to the D200 until then, actually I'm willing to argue that the XTi surpasses the D200 in many areas. I feel there are 2 importand tools used to create an excellent photo. The camera features provide 80%. the remaining 20% is the software used to perform final ajustments. Every digital camera I have owned (5)comes with software, each one has their own strengths. I use software which is the BEST overall, lets share your ideas about the BEST DIGITAL SOFTWARE, and at what cost. No matter how bad the situation it is! If you insist on, tomorrow is another day! Did you agree with me?